I've been working on the next stages for the pluggable belief system, integration of a bayesian network sub system. I wanted to ensure I really understood what was going on, so I have been writing my own implementation. I now have a fairly efficient algorithm that can produce optimal junction trees, from a given graph. It first moralises and then triangulates before producing the final junction tree. The junction tree algorithm transforms a graph into a tree, so that the network propagations at runtime are no longer NP -hard. I've written a lot of low level unit tests, for all the small working parts - as I really want to be sure I'm building something solid, and it's not enough to simply test the final transformation results. To get an idea of how it looks, I've created unit tests for the examples in the two tutorials above. Notice it uses BitSets to encode cliques, for efficiency. 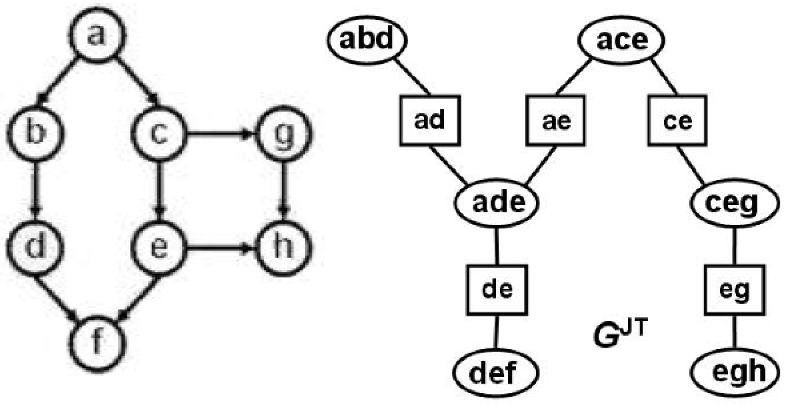 Only the first main bayesian network is represented as a graph of objects, after that all transformation work is done via an adjacency matrix - which keeps it light and fast. Next I'm going to work on the message propagation. I'm hoping to have this fully integrated and usable in the pluggable belief system, in 4 to 6 weeks. I'll blog my progress. // from "Bayesian Belief Network Propagation Engine In Java"
// the result here is slightly different, due to ordering, but it's still correct. I would enjoy being a beta tester, we use BBN software at work, is I could reuse some testing to compare results.